I grew up in North Providence, a suburb of Providence dominated by strip malls and centered around one main drag called Mineral Spring Avenue, which is the kind of road all of the cool kids used to cruise up and down on on Friday and Saturday nights when I was in high school. Mineral Spring is the typical busy, long suburban street full of fast food restaurants, family-owned businesses and plenty of strip malls featuring the likes of places like CVS and the local sub shop. In fact, Mineral Spring Ave, at least in my mind, is most famous for the fact it has two Dunkin Donuts less than a mile from each other. Clearly, D and D is quite important to us North Providence folks. Another random fact about NP– it has one of the highest concentrations of Italian Americans outside of Italy! In fact, when I was in high school, the President of Italy at the time came to North Providence as part of his U.S. tour! On Saturday night, my husband and I decided to venture to my hometown to dine at Jacky’s Galaxie, located on the ever-so-exciting Mineral Spring Ave. 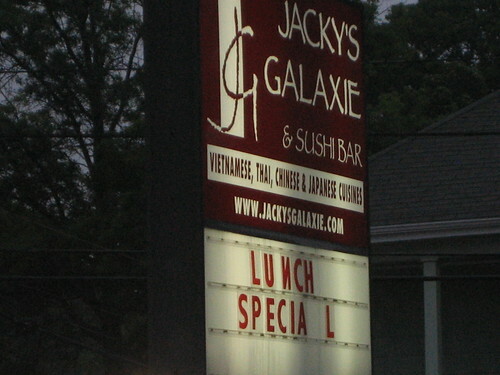 If that restaurant name sounds familiar, it’s because there are numerous Jacky’s Galaxies in Rhode Island, including the one in Providence I have mentioned before called Jacky’s Waterplace. Jacky’s North Providence is one of our favorite Asian restaurants in Rhode Island, as it is low-key, never too busy, but with a large menu and very delicious food. It’s also so easy to get to from Providence, with a location right off the highway! We went there on Saturday because we were in the mood for a relaxing and casual meal, which is exactly what we ended up with. We were seated promptly, right near the sushi bar so we had plenty of entertainment for the night watching the chef prepare his creations. 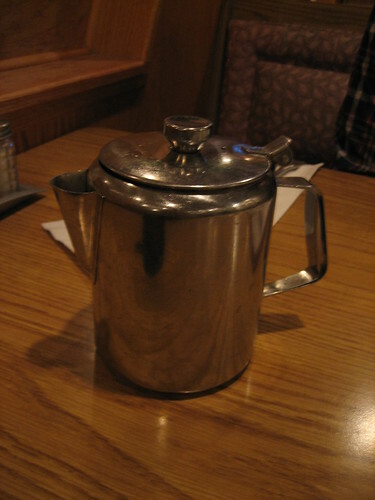 I ordered my usual hot green tea, which came in a large pot. 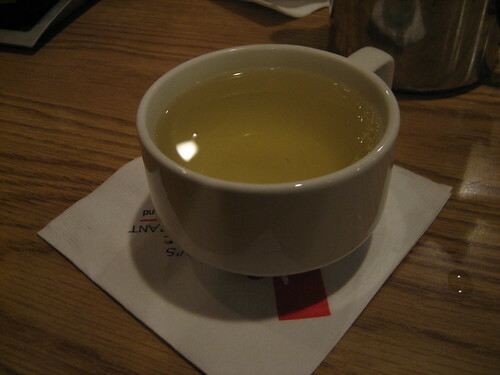 I like the fact the tea was served in massive quantities, as I drink it like water and didn’t even have to ask for a refill! While I hadn’t been to Jacky’s North Providence in a bit, I already knew what I was going to order. 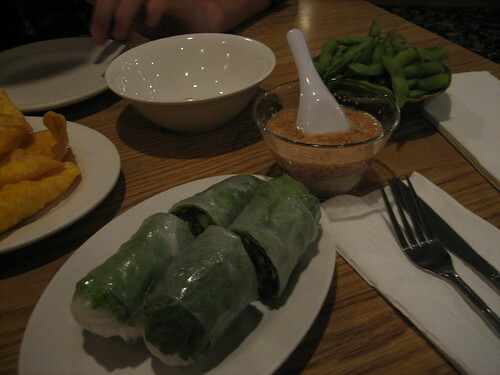 It wouldn’t be a complete meal without ordering my absolute favorite Asian restaurant appetizer– nime chow, aka spring rolls stuffed with veggies and rice noodles served with an addictive sweet and savory peanut sauce. I devoured most of it, leaving only one measly quarter piece for my husband. 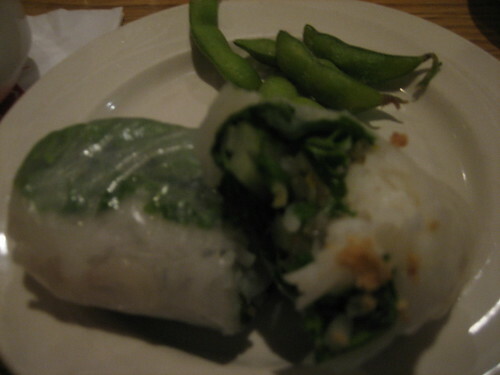 Their nime chow is great– the individual rolls are so stuffed they are bursting at the seams! I also appreciated how they generously served their peanut sauce in a little bowl that is much larger than what most Asian restaurants use to serve dipping sauces. The more peanut sauce, the better! 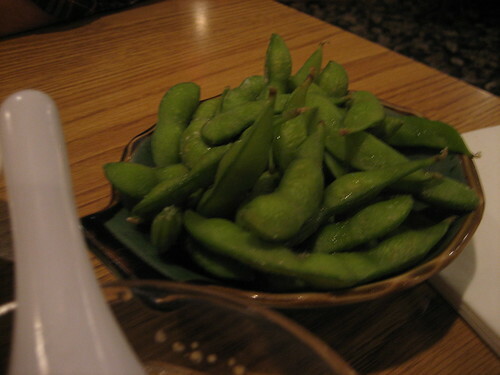 We also snacked on a bowl of salty edamame– again, the portion size was huge! The apps alone could have made quite a delicious meal! 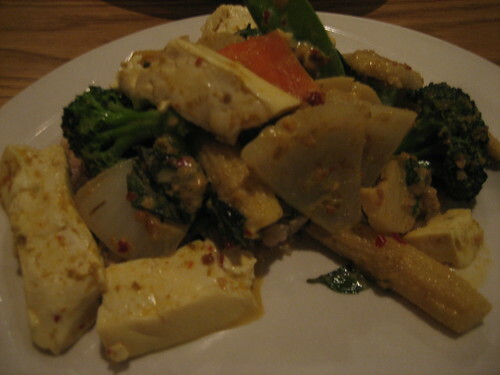 For dinner, I ordered their vegetables in lemongrass, to which I added steamed tofu for an additional dollar. 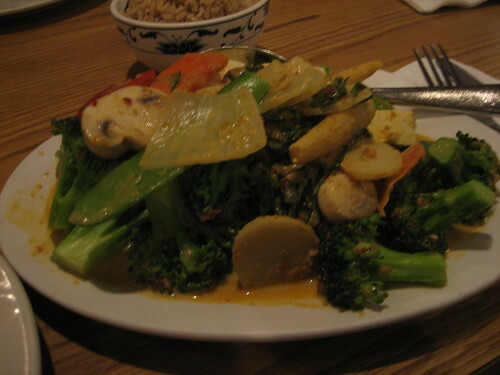 I love this Thai-style dish– it is saucy (perfect for mixing with rice) and full of fresh veggies like broccoli, water chestnuts, carrots, baby corn, peppers, mushrooms, and onions. The tofu pieces are sizeable, as is the whole dish altogether. This restaurant doesn’t skimp when it comes to portion sizes, that’s for sure! I could barely eat a third of it! 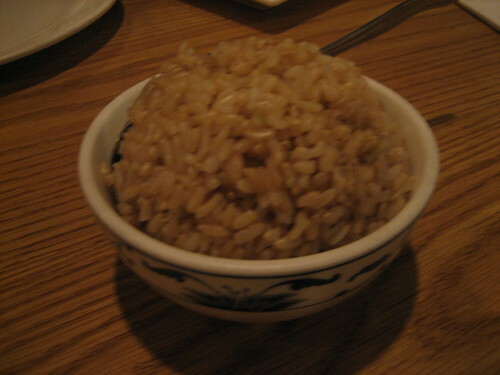 I obviously ordered brown rice to go along with it– kudos to Jacky’s for offering brown rice! The saucy veggies and tofu and brown rice were the ideal combo of flavors and textures. I was beyond satisfied with this meal! Not only was it delicious, but with the mounds of veggies and steamed tofu, I believe it was fairly healthy too! Jacky’s served us some tasty eats in a very cozy and comfortable atmosphere. The service was prompt and attentive, the mood was chill and the food delighted my vegan, low-gluten taste buds! Sometimes it is worth getting out of the city to go back to your roots! What’s your hometown? Do you have a favorite hometown restaurant?